DELTA TEST has many years experience in testing turbine blades in power plants or flue gas desulfurising plants. 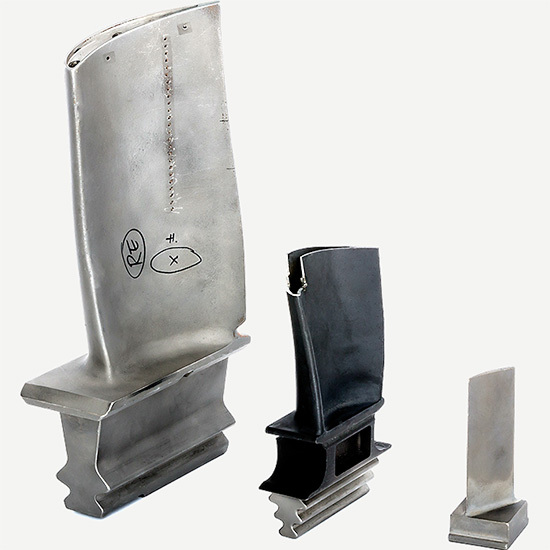 The non-destructive testing of turbine blades is particularly important in the heavily used areas of small cross sections, i.e. edges. By using necessary cooling systems, the volume able to take a load is reduced again, so that loads and crack probability can increase further. While the large blade surfaces can be inspected easily with conventional eddy current test systems of surface crack tests, special sensor systems are indispensable for the heavily used edges. The edges of the turbine blades in their mounted state are tested for cracks by using special eddy current sensors, and the crack depth of the found flaws is determined. Documentation can be in simple lists with good/bad categories or by graphical display.